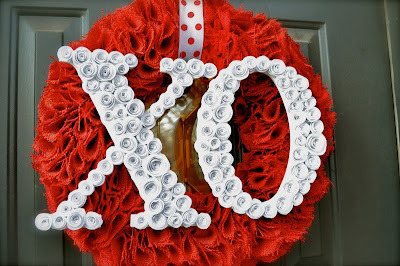 I told you I was going to use my red burlap Christmas wreath for Valentine's, and I have. It was way too much work to only use for one holiday! 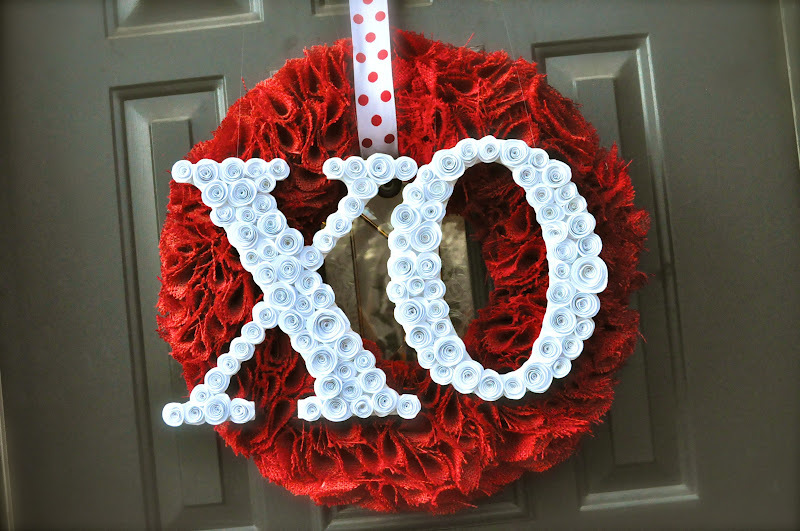 I added an X and an O covered with rolled roses so it didn't look quite so Christmas-y to me. They honestly didn't take me that long--I think I did it in three episodes of "Lost" on DVD, plus an episode of 30 Rock to glue them on. Here's a little how to (and video!) 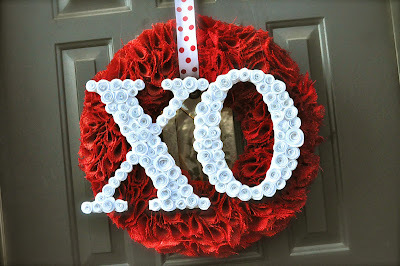 for the spiral rose-covered letters (you can find the wreath tutorial here). Can I just say that I LOVE Valentine's crafts? I wish I had more time for all the Valentine ideas in my head! 1. 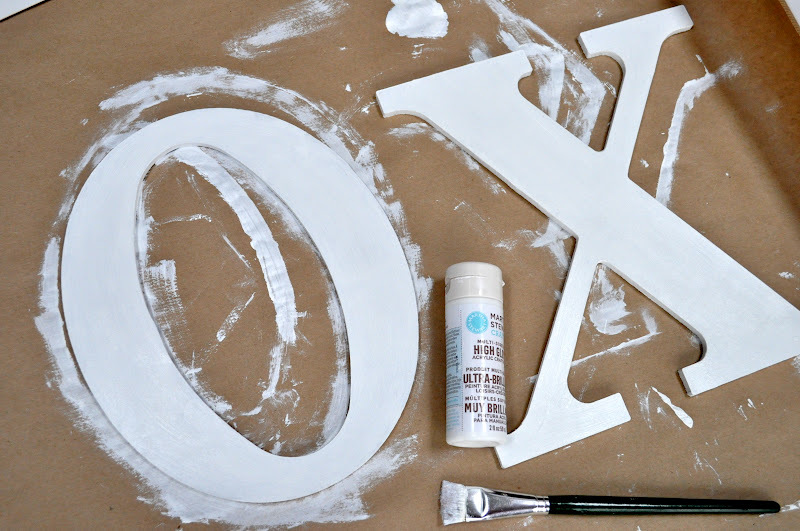 The first step is to paint your letters the same color as your paper. This will make the holes between flowers less noticeable. I used Martha Stewart's craft paint in "Wedding Cake". 2. Cut your card stock into squares. I used these two arrangements to get a good variety of sizes. I also cut 2-3 pages at a time to save time! Then cut those squares into spirals. The width of my spirals is about .5". You can watch my video tutorial here. It's a bit fancier than the flowers I did here, but it will help you get the concept if you're more of a visual learner like me. Did you watch it? First, try to forget what a dork I sound like on video. Thanks. Next, you might have noticed that for this project I didn't cut the wavy line around the edges for these flowers, and I used hot glue on the bottom of the flower to make the project go MUCH faster. Those are the major differences. 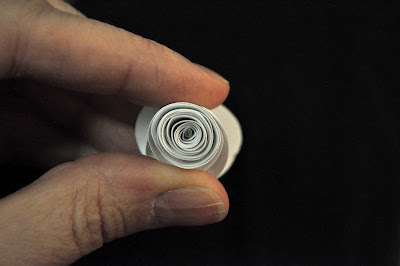 If you didn't watch the video, here's a quick how to on the spiral roses. Roll your spiral up from the outside in, making a tight spiral. Then let go of your spiral and watch it bloom! Turn the flower over and put a bit of hot glue on the bottom in the middle of the spiral. Press the very inside of the spiral flat against it to hold it together. Now sit down in front of your favorite Valentine's chick flick and make a boatload more of them. 3. 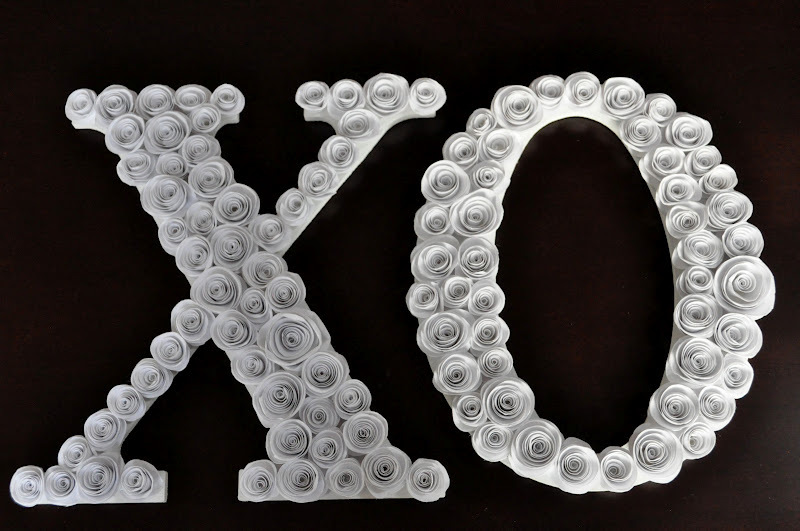 Start gluing your roses to your letters. I laid out a few at a time to make sure they were going to fit well. Don't be afraid to smoosh them in close together. 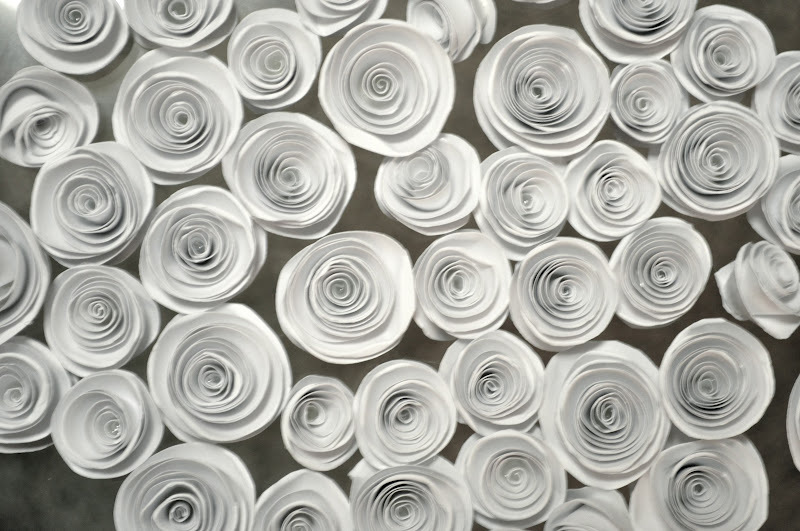 It's just paper--you won't ruin the flowers. Continue until your letters are covered. These letters were originally going to be on my mantel, but I decided the burlap wreath needed a little somethin' somethin'. First I hung the wreath with a piece of polka dot ribbon. To hang the letters, I attached picture framing hardware to the back and strung them with fishing line. The fishing line is secured to the top of my door. I hammered two small nails to the top of the door and bent them down, then wrapped the fishing line around them. Sounds weird, but I use this method for most of my wreaths! 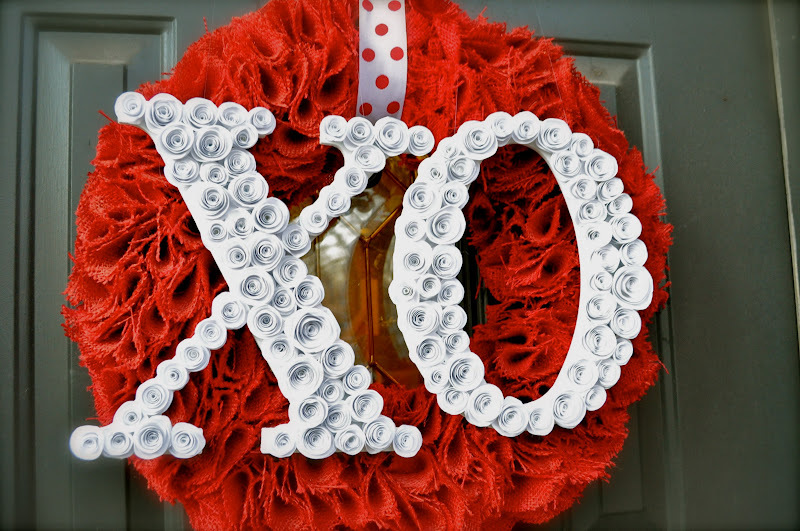 This Valentine's craft project was brought to you by Phonechay's Creations! I LOVE the letters. I just bought some a couple of weeks ago to do a Valentine's craft, but I've been procrastinating getting started on it. I might have to incorporate some paper roses now! How long did the entire wreath take you?? I adore this wreathe so much! Thank you for sharing that project!!! I love this! What a beautiful wreath. I'd love for you to link this up to my I Heart Projects Linky Party. Very cute. When I hang things on my door, I just use a staple gun to the top of the door. I LOVE this! So so adorable! Wow! When I first saw a pic of the wreath, I thought those were buttons, but they're little roses! Cute! 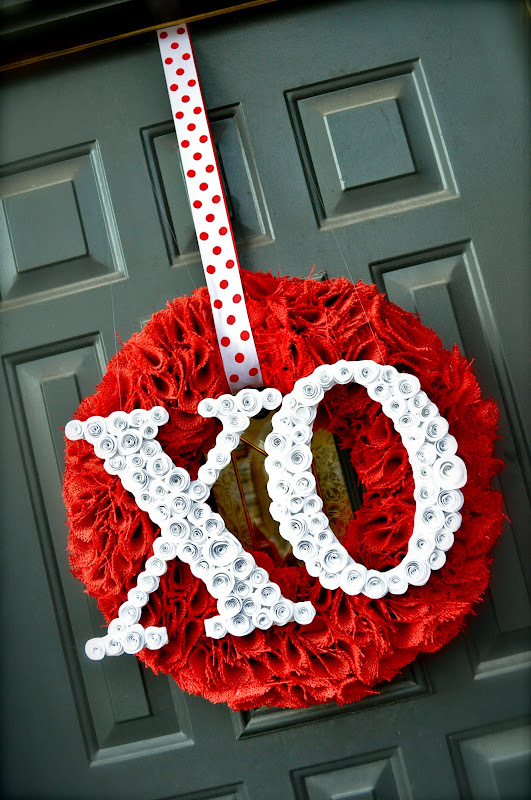 I'm pinning your gorgeous wreath!